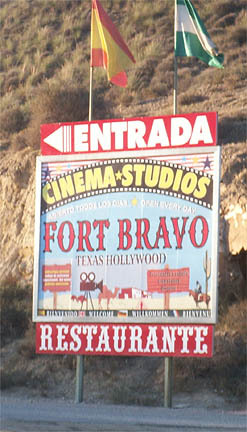 There is an Autovia (Americans should read that as a freeway) that could have gotten us to Fort Bravo in a little over an hour but we wanted to take the scenic route along the mountains. A route that was to take about 2.5 hours. Between Granada and the coast are two mountain ranges running east and west, the northerly one is the Sierra Nevada (the highest mountains in Spain and with snow on top) and the southerly one is the Sierra de Contraviesa and a valley runs between them about 30 km south of Granada. We planned to use the two-lane that went up the valley. We got about 20 km up the valley road and it was washed out. They were diverting traffic to the south onto a 1.5 lane road that ran up to the top of the southern mountain range where we could see the Mediterranean in the distance. 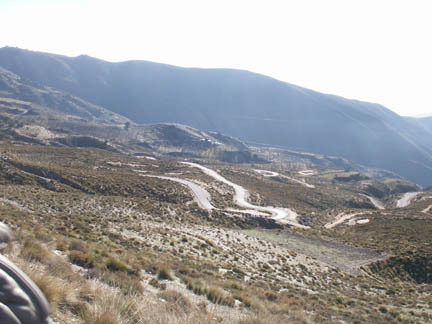 This was a much windier road and it climbed the mountains to about 4,500' elevation (Granada is about 2,200'). We traveled on this road for 3 hours, through valleys, over ridges, along hillsides, past vineyards and small towns and into a huge construction area where the road was completely torn up, heavy equipment working in the middle of the road (remember it's only 1+ lanes wide) where we followed a big dump truck down the winding road. All of this with no warning signs or flagmen. If we'd been in a car we'd have been held up even longer, the bike could squeeze between the equipment and make it through without waiting. Eventually we found a road that dropped back into the valley and after six hours we arrived at Fort Bravo. 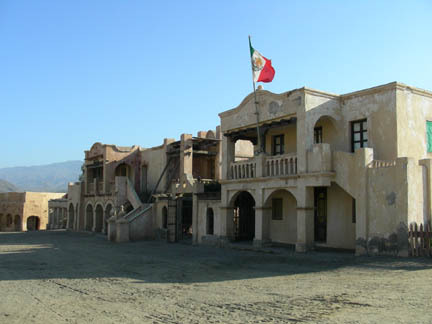 This is where the Spaghetti Western was invented by the director Sergio Leone. 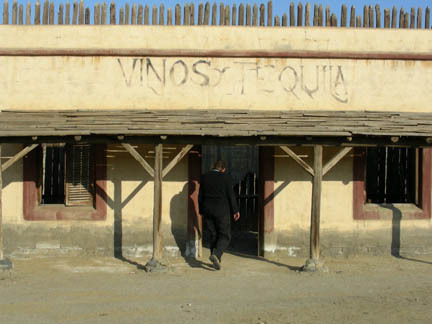 Clint Eastwood became famous as "The Man with No Name" in Fistful of Dollars and other movies. The list of movies and music videos made here is quite extensive, including many for non-American audiences. 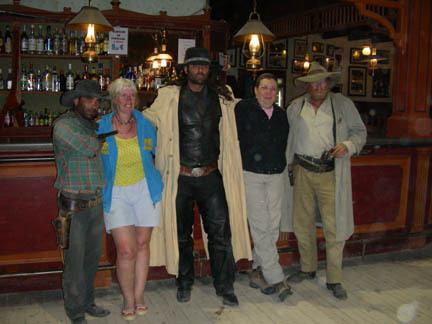 The American Western movie is very popular in many parts of the world. There are four main parts to the complex. 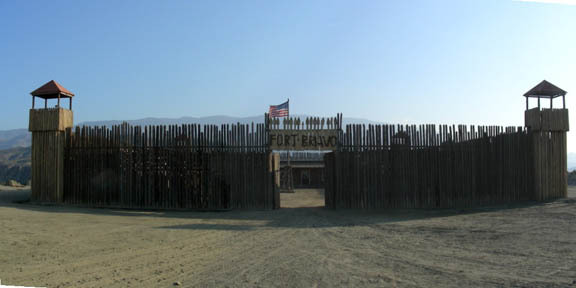 An Indian teepee village (which was across a deep gorge and we didn't visit it so no pictures of it), a wood stockade fort (with An American flag flying), a Mexican town (with the Mexican flag flying) and a western town. 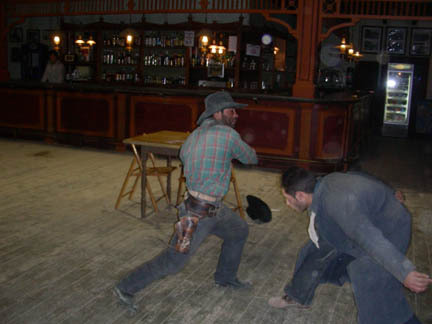 The saloon was open for business and was where they held the wild west show. We arrived a little after 4 in the afternoon and the shootout was scheduled for 5:30 so we wandered around and inspected the sets. Most were in pretty poor shape. But considering that they were often fronts with no roof or interior. Even the four-sided buildings were often roofless. 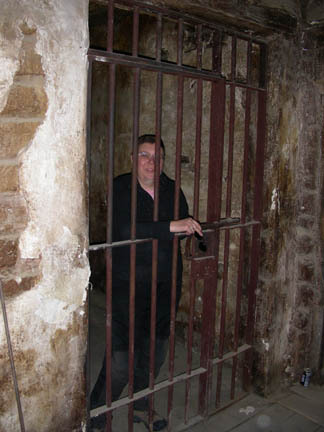 and was locked up very quickly. 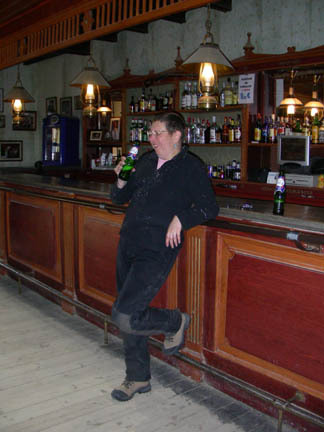 I paid her bail and took her to the saloon to drown her sorrows. After her beer we went for a buggy ride around town. 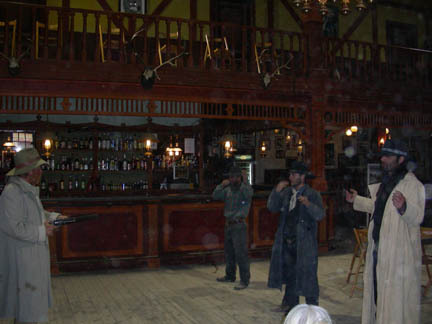 Finally the big moment arrived and the various cowboys, sheriff and bartender all gathered in the saloon. The script was in Spanish and we didn't understand any of it, but it was exciting to watch. In the audience was the two of us and a British couple taking their motorhome on a trip to drier climates. Not much profit today. 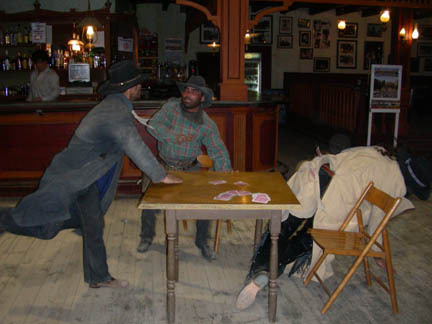 There was a saddlebag full of gold and a disagreement over a card game. Then the sheriff arrived and told them to behave, but they didn't. 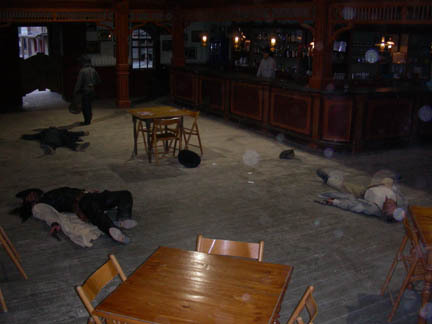 A fight and then a shoot-out ensued and the sheriff returned and he was killed. 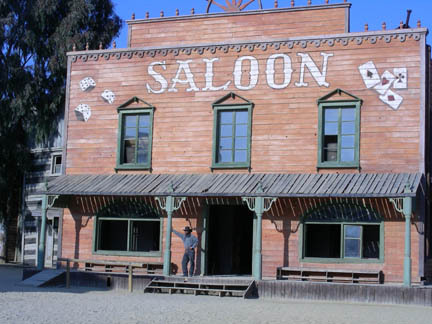 As the surviving cowboy leaves with the gold and without paying his bar bill, the bartender shoots him and keeps the gold. And the obligatory photo-op with the stars. 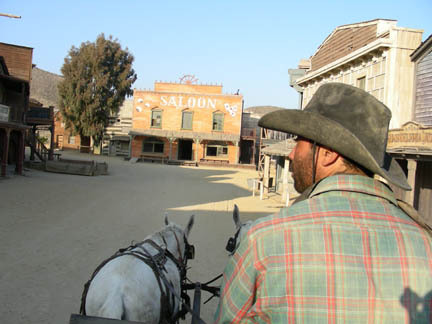 We left Fort Bravo about dark and headed into the tiny town of Tabernas looking for a hotel. The one in town was full but we found an old run-down hostel outside of the far side of town, just as we were giving up on finding anything. It was empty but had secure parking for the bike. The elderly lady who ran it was very nice and cooked us an excellent dinner and served a local wine that her husband took a pitcher down the road and came back with it full. The room was unheated and when we woke up it was 47 F in the room. We thought we were camping again, except the bathroom was closer. The next morning we packed and headed for the town of Guadix, which is supposed to have cave houses.